I’ve been experimenting for some time now on different types of posts, to see how they drive traffic to my site in different ways. From the use of Google Analytics and my experience, I’ve managed to compile a list of the 6 different types of posts I write, ordered by the amount of traffic they drive to my site and I have to say, I was a little surprised by some of the results. It’s no secret that top lists drive traffic to your site, particularly if they’re based on 1 person’s opinion, that other people may disagree with. The idea of the top list is that you take a collection of 10+ websites or people and then you organize them into an order that you think is right. This is a good way of making your website appear as if it’s an authority when you’re just starting out, as people pay more attention to the content then they do to the website, which may not have all that much content on it yet. In the past 80 days on my new website we’ve received 1,131 unique visitors though search engines from 512 different keywords. 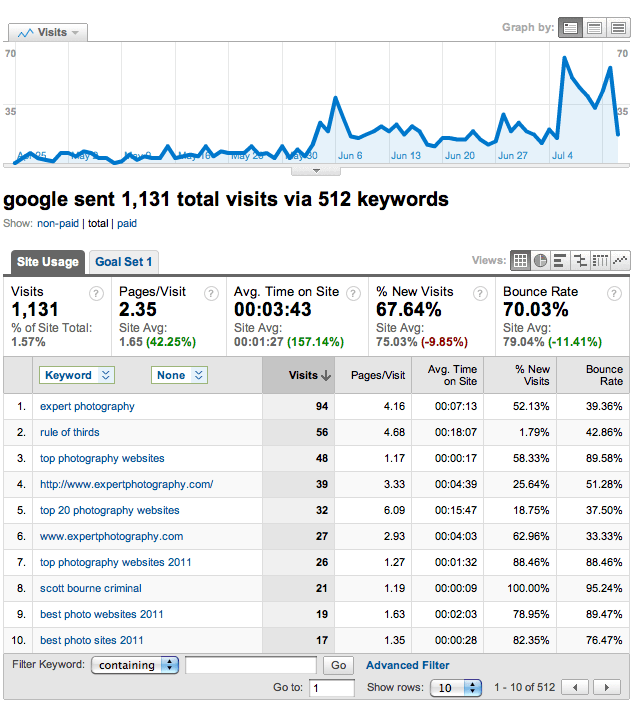 Out of the top 10 of these results, 5 of them are a variation of the term ‘top 20 photography websites’. Not only has this post sent traffic to my site, it’s making it more recognizable in Google, which will then lead to more hits for different search terms. 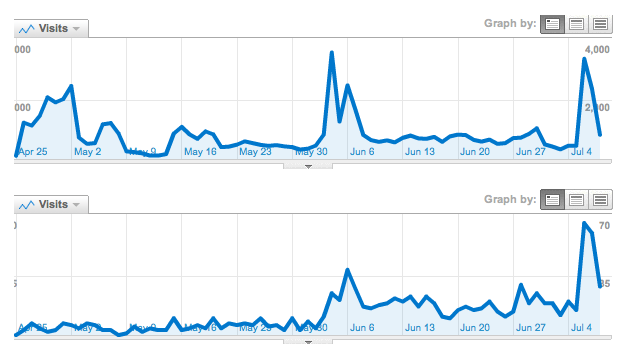 Have a look at the example I used below in my post on why my first blog wasn’t successful, and you’ll see the top image is a timeline of traffic- notice 3 spikes in traffic. The first one, in April, was when I posted the top 20 photography websites post and the second one, in May, was the most influential photographer bloggers. As you can see when you compare them to graph below of search engine traffic, spikes in traffic like that with people posting my link around the internet makes a big difference to the amount of search engine traffic I receive. The final spike was a recent link sharing from Adobe Lightroom to 400,000 fans, which has also made a difference to my search engine traffic. The trick is to either make the title of your list something that people want to know, or include people who will link to it. For example, if people were into photography, they would want to find the best websites to learn, and even though we don’t include ourselves on the list, that search does bring them to us. The second post that I wrote was called ’20 Most Influential Photographer Bloggers’, and that massaged the right peoples egos into sharing the list with their followings, which depending on your niche, can be hundreds of thousands, if not millions of people. 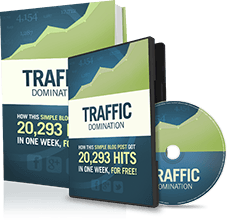 If you do these types of lists as an annual thing, you can rearrange them a little bit each year, but most of the work is already done for you, making it easy for when you want to get a boost in your traffic again. The amount of people you have regularly visiting your site makes a difference in the amount it’s going to be shared, as the more people who see it early on, the more likely they are to share it. That’s why I recommend doing it annually so that can see the difference it makes. 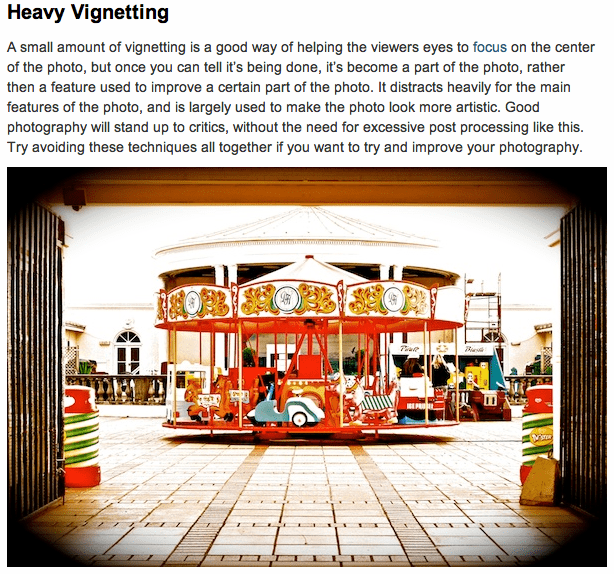 This was perhaps the most surprising finding I had when researching this post; the amount of people that view my earliest posts about the very basic parts of photography are very high compared to the rest of my posts. They’re lengthy articles, all titled something like ‘4 steps to understanding…’, a format of writing that I’ve actually moved away from. This shows me that people like to be walked through information that explains everything in detail and in the right order. Here’s an example of my most popular post of its kind, and as you can see, it contains a lot of information, basically laid out, with important points getting their own paragraph and is written as if I’m talking directly to the reader, answering their questions. I believe it’s a combination of this writing style and quality of important, yet basic information that has helped to make this a successful post. Similar to a top list, this sort of post offers clear, concise and easy to read information for the reader to understand. There’ no really lengthy writing, usually just a paragraph and a photo per point on my posts. As I’ve mentioned before, people rarely ever read the whole post when they open it, and if they can get away with reading a headline and looking at a photo, they will. In one of my latest posts, I’ve written it so that people only have to read a title and look at a photo to understand what I’m talking about, and I’d imagine that only people who don’t understand or disagree would look any further than that. These posts are easy to read and allow the user to gain information without having to do much reading. I personally don’t think that this is a very good way to learn, because although you might remember it for an hour or 2, it won’t stay in your memory for long without a strong understanding of why. This is however a good way of bringing people into your site, and if you’re clever about the words you use, you can link to plenty of other posts about your website, like I’ve done in this post. These are the slightly more unusual posts that appeal to slightly less people, but still hold a following. For me, it’s Photoshop tutorials of special effects; they’re not photography tutorials but they still apply as they use photos. You need to be careful about writing this sort of thing as a niche is restricting to the amount of people who will read it in the first place, and when you add another niche, the number becomes even less. It’s often hard to come up with good topics to write about, and you’re never going to be able to appeal to all of the people, all of the time, so my advice is that you don’t bother. You need to write for yourself rather then anyone else if you want to enjoy what you’re doing, so if you feel like these posts are still going to be of interest to people, then it’s worth writing. I started writing a series of tutorials called ‘Shoot My Shot…” where I show the reader a photo that I’ve taken and then the steps that I took to get there. It’s essentially a behind the scenes look at how I work and it’s a good idea, I’m sure of that, but before I do too many of them, I need to market myself as part of the brand, rather than just the name ExpertPhotography; people need to first recognize that it’s me doing all the writing, and then they need to be interested in what I have to show them about taking a photo. To help people recognize me as a person, we’re adding an about the author section at the end of every blog post which contains a photo of me and a little information. We already do our Twitter marketing under the name ‘PhotoJosh’ so that people feel they have a more personal touch with someone that can help, rather then a corporate facade. I’m going to continue to write more posts like this as there is a request for new ones and they’re very useful to people willing to read them. It’s important people know who you are if you want them to care about what you personally have to say. Posting a ‘Photos From April’ post, was an idea that I came up with after my first month of April, and thought would be a good way to get people interested in the site and see some cool photos and tutorials. The idea was that everyone like to look at photos, especially when they’re into photography, but the problem I faced was that I was straying from my niche; I run a photography tutorial website, not a picture gallery. You can see an example here, and all the photos link to the tutorial that they’re featured in, but there was no writing telling them anything about them. I did these posts for April and May before stopping as they’ve had a total of less than 150 views each on them and I might try it again in 6 months when I’ve got a stronger following, and maybe include some text explaining what the tutorial is about. Remember, don’t stray from your niche if you want to keep your readers interested. Hope this helps, as always, you can check out my website here and my other posts on this website here. Great read! Totally agree that ‘Top Lists’ are a great way of attracting visitors. Not only are they interesting to read, but people find that they are easier to read when they are broken up into points. Tutorial on how to write the ultimate top list is coming soon! Awesome Post! I think we all need to focus on creating good useful content like this. It will make people think we are cooler for doing so and it will make the info on the web a lot better. Some good points here. There’s nothing like a Top Tips list to add quality to a blog. keyword rich, targeted and informative content, all bloggers love em, myself included. Always a good read. I am also attracted to articles about gaining traffics. It keeps me going and it keeps all my work on the top. This is something that you guys probably already know, but I have a small fitness niche blog that I’m working on, and in one of my recent articles I wrote for it, I was in sort of a goofy mood and cracked some jokes within the article- then I didn’t look at it for a week or two. Then yesterday I noticed that it had been “liked” on Facebook over 20 times- and this site still doesn’t get much traffic. It was a big reminder to me to keep in mind that real people are reading our content- and to write posts like you’re talking with a good friend- instead of like you’re giving a report. I get a lot of hits from surveys. I advertise links to the results of my surveys via LinkedIn or Twitter and get a lot of attention this way. Good article – your blog has helped me tremendously – I went from 1,000 to over 5,000 visitors per month using some of your tips. I noticed that the pages of my new blog that bring the most traffic are two very niche specific top five lists and one in particular that’s geared toward men of a certain persuasion (an area where I really have little knowledge). A top ten list posted nearly 2 months ago dealing with religious themed books has not done nearly so well even though it was far more researched than the 1st and more in tune with my background. It just goes to show that what the audience wants is more important sometimes than what I want to write about. I love your point about writing top posts Josh because it really does bring traffic and adding some “author insights” posts might also make a difference. I started writing a lot of top 10 posts sometimes ago but some of my readers emailed me that they don’t like it like that and it would be better if I started doing a mix – while I think top list posts work, I also think it is better to be mixing them with “how to” posts and tutorials so that readers won’t feel like they’re reading the same thing everyday. Thanks so much for the awesome post and have a great day! The top list is a proven traffic getter although I would always say that bloggers need to be careful with their top ten post. Most bloggers are already aware of this fact but right now I’m seeing that lots of bloggers seem to force it a little which makes a bad effect on the post. I would always like to suggest to have a great balance of normal posts and those types of post. I have done a top list recently and for sure, they receive a bit more traffic then usual posts because its content that people find original. I work so impressive he really is very detailed I’ve noticed lately that the traffic that comes to me are the video platform for social networking and although the videos do not come much sending several videos a month is great. Hello Josh! Really good info here, even I do online marketing for some times now but I am completely new to blogging. Inspiring post for me to create better blog post. Thank you for sharing. I am happy to find out that at least someone out there is really like me. Great post man, not only this one. I have read your photography blog and its look great.